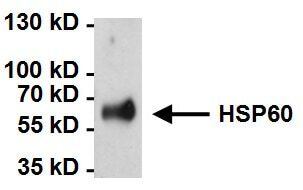 ab5479 detects Hsp 60 from Human cells, tissues and recombinant protein preparations. This antibody displays no other protein or species cross-reactivity. Other Immunogen Type corresponding to Human Hsp60. Human placental Hsp60. Epitope mapping studies using human Hsp 60 deletion mutants suggest that this antibody binds between amino acids 211-288. Our Abpromise guarantee covers the use of ab5479 in the following tested applications. IHC-P Use a concentration of 1 - 10 µg/ml. IP Use a concentration of 2 µg/ml. WB Use a concentration of 1 - 10 µg/ml. Detects a band of approximately 58 kDa. Western blot analysis of various cell lines (50µg/lane) labeling Hsp60 with ab5479 at 1µg/ml. Immunocytochemistry/Immunofluorescence analysis of Hsp60 (green) in Hela cells. Formalin-fixed cells were permeabilized with 0.1% Triton X-100 in TBS for 5-10 minutes at room temperature and blocked with 3% BSA-PBS for 30 minutes at room temperature. Cells were probed with ab5479 at a dilution of 1:200 and incubated overnight in a humidified chamber. Cells were washed with PBST and incubated with a DyLight-conjugated secondary antibody for 45 minutes at room temperature in the dark. F-actin (red) was stained with a fluorescent phalloidin and nuclei (blue) were stained with DAPI. Images were taken at a 60X magnification. Immunocytochemistry/Immunofluorescence analysis of Hsp60 (green) in A431 cells. Formalin-fixed cells were permeabilized with 0.1% Triton X-100 in TBS for 5-10 minutes at room temperature and blocked with 3% BSA-PBS for 30 minutes at room temperature. Cells were probed with ab5479 at a dilution of 1:100 and incubated overnight in a humidified chamber. Cells were washed with PBST and incubated with a DyLight-conjugated secondary antibody for 45 minutes at room temperature in the dark. F-actin (red) was stained with a fluorescent phalloidin and nuclei (blue) were stained with DAPI. Images were taken at a 60X magnification. 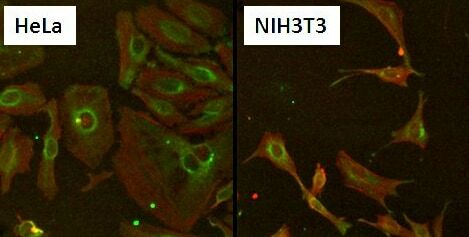 Immunocytochemistry/Immunofluorescence analysis of Hsp60 (green) in NIH-3T3 cells. Formalin-fixed cells were permeabilized with 0.1% Triton X-100 in TBS for 5-10 minutes at room temperature and blocked with 3% BSA-PBS for 30 minutes at room temperature. Cells were probed with ab5479 at a dilution of 1:20 and incubated overnight in a humidified chamber. Cells were washed with PBST and incubated with a DyLight-conjugated secondary antibody for 45 minutes at room temperature in the dark. F-actin (red) was stained with a fluorescent phalloidin and nuclei (blue) were stained with DAPI. Images were taken at a 60X magnification. Immunocytochemistry/Immunofluorescence analysis of Hsp60 in HeLa Cells. Cells were grown on chamber slides and fixed with formaldehyde prior to staining. Cells were probed without (control) or with ab5479 at a dilution of 1:100 overnight at 4 C, washed with PBS and incubated with a DyLight-488 conjugated secondary antibody. 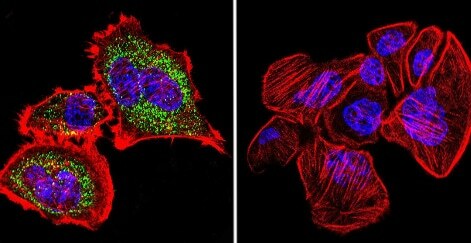 Heat Shock Protein 60 (Hsp60) staining (green), F-Actin staining with Phalloidin (red) and nuclei with DAPI (blue) is shown. Images were taken at 60X magnification. Immunocytochemistry/Immunofluorescence analysis of Hsp60 in NIH-3T3 Cells. Cells were grown on chamber slides and fixed with formaldehyde prior to staining. Cells were probed without (control) or with ab5479 at a dilution of 1:100 overnight at 4°C, washed with PBS and incubated with a DyLight-488 conjugated secondary antibody. 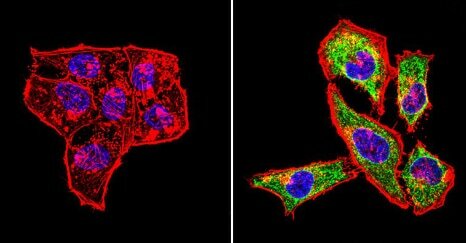 Heat Shock Protein 60 (Hsp60) staining (green), F-Actin staining with Phalloidin (red) and nuclei with DAPI (blue) is shown. Images were taken at 60X magnification. Immunocytochemistry/Immunofluorescence analysis of Hsp60 in U251 Cells. Cells were grown on chamber slides and fixed with formaldehyde prior to staining. Cells were probed without (control) or with ab5479 at a dilution of 1:200 overnight at 4°C, washed with PBS and incubated with a DyLight-488 conjugated secondary antibody. 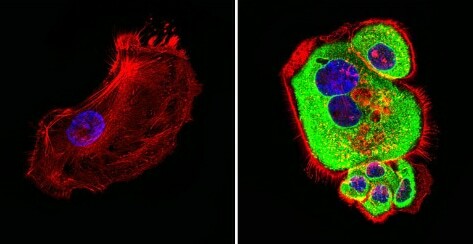 Heat Shock Protein 60 (Hsp60) staining (green), F-Actin staining with Phalloidin (red) and nuclei with DAPI (blue) is shown. Images were taken at 60X magnification. 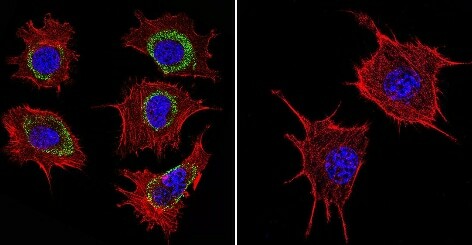 Immunocytochemistry/Immunofluorescence analysis of HSP60 (green) in HeLa and NIH3T3 cells. Formalin fixed cells were permeabilized with 0.1% Triton X-100 in TBS for 10 minutes at room temperature and blocked with 1% Blocker BSA for 15 minutes at room temperature. Cells were probed with ab5479 at a concentration of 10ug/ml for at least 1 hour at room temperature. Cells were washed with PBS and incubated with a fluorescently labeled goat anti-mouse IgM secondary antibody at a dilution of 1:400 for 30 minutes at room temperature. 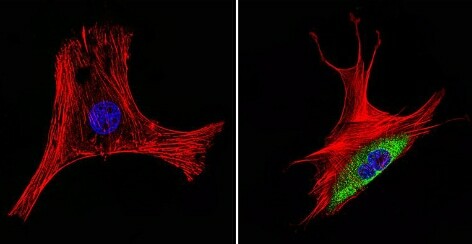 F-Actin (red) was stained with DyLight 554 Phalloidin and nuclei (blue) were stained with Hoechst 33342 dye. Images were taken at 20X magnification. 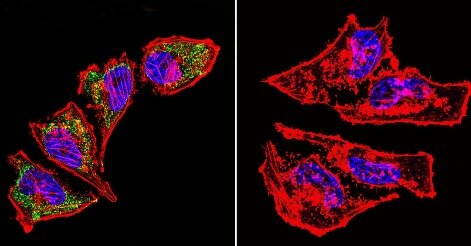 Immunoprecipitation of Hsp60 was performed on HeLa cells. Antigen-antibody complexes were formed by incubating 500ug of whole cell lysate with 2ug of ab5479 overnight on a rocking platform at 4°C. The immune complexes were captured on 50ul Protein A/G Plus Agarose, washed extensively, and eluted with 5X Lane Marker Reducing Sample Buffer. Samples were resolved on a 4-20% Tris-HCl polyacrylamide gel, transferred to a PVDF membrane, and blocked with 5% BSA/TBST for at least 1 hour. The membrane was probed with ab5479 at a concentration of 1ug/ml overnight rotating at 4°C, washed in TBST, and probed with a goat anti-mouse IgM secondary antibody at a dilution of 1:20,000 for at least 1 hour. Chemiluminescent detection performed using SuperSignal West Dura. Immunohistochemistry was performed on both normal and cancer biopsies of deparaffinized Human breast carcinoma tissues. To expose target proteins heat induced antigen retrieval was performed using 10mM sodium citrate (pH6.0) buffer microwaved for 8-15 minutes. Following antigen retrieval tissues were blocked in 3% BSA-PBS for 30 minutes at room temperature. Tissues were then probed at a dilution of 1:20 with a mouse monoclonal antibody recognizing Heat Shock Protein 60 ab5479 or without primary antibody (negative control) overnight at 4°C in a humidified chamber. Tissues were washed extensively with PBST and endogenous peroxidase activity was quenched with a peroxidase suppressor. Detection was performed using a biotin-conjugated secondary antibody and SA-HRP followed by colorimetric detection using DAB. Tissues were counterstained with hematoxylin and prepped for mounting. Immunohistochemistry was performed on both normal and cancer biopsies of deparaffinized Human kidney tissue tissues. To expose target proteins heat induced antigen retrieval was performed using 10mM sodium citrate (pH6.0) buffer microwaved for 8-15 minutes. Following antigen retrieval tissues were blocked in 3% BSA-PBS for 30 minutes at room temperature. Tissues were then probed at a dilution of 1:100 with a mouse monoclonal antibody recognizing Heat Shock Protein 60 ab5479 or without primary antibody (negative control) overnight at 4°C in a humidified chamber. Tissues were washed extensively with PBST and endogenous peroxidase activity was quenched with a peroxidase suppressor. Detection was performed using a biotin-conjugated secondary antibody and SA-HRP followed by colorimetric detection using DAB. Tissues were counterstained with hematoxylin and prepped for mounting. Publishing research using ab5479? Please let us know so that we can cite the reference in this datasheet. There are currently no Customer reviews or Questions for ab5479.